Some of you may not know but besides making Bond fan art posters I am also a filmmaker. Since I was 13 or so I have wanted to be a filmmaker but thought that would be beyond my reach. I started making fan art posters in 2003 which eventually encouraged me to pursue a digital media career. If I couldn’t make films maybe I could at least make film posters. I enrolled in a local university intending to take art classes for drawing and digital media but found out the offered a film class as well. That became my major and I never looked back. I earned both a bachelor’s and master’s in Art during my time in the film program. My thesis to earn my MFA was to write and direct my own feature length film. My university shoots a feature film every summer. When my script was ready my film was shot in the summer of 2013. Nine months of post work and it was completed in May of 2014. 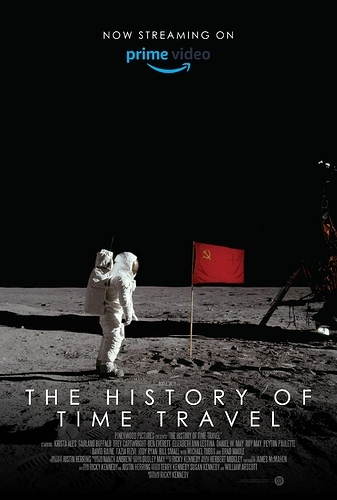 The film is entitled The History of Time Travel and it is a fictional documentary about the creation of the world’s first time machine. The film deals with the cold war so their are spy elements throughout. The film has played at several film festivals including the Austin Film Festival and the Boston Sci-Fi Film Festival. Well I happy to say that the film is now streaming on Amazon Prime and I would very much appreciate if you were to check it out. *If self promotion is against the forum rules please delete. Congratulations! Never underestimate the will power, paracetamol and sleepless nights it takes to get a film from the starting line to past the finish post. Well done indeed and i look forward to having a watch. That sounds very interesting and original. I love the idea oftimetravel, so will check this out. Just watched this today, brilliant!!! Absolutely brilliant! Me too. And how things changed around us each time something happened, that was impressive. My compliments to all involved in this film.